HTC have always received credit for their Sense UI, which has emerged, deservedly, as the standard-setting custom skin for Android. We were duly impressed with the One X in our review and called it the best smartphone experience to date - in terms of both visuals and features. Samsung's flagship, on the other hand, is late to the market but the Koreans turned the delay in their favor. Instead of rushing their most important device to launch, they took the time to respond to every advantage the opposition had to offer. To be fair, Samsung's TouchWiz did need to catch up with the HTC Sense in some departments and the new lockscreen on the Galaxy S III is a prime example. Not only is it visually appealing, it matches all the functionality of its Sense counterpart and goes even further. The new tap-to-hold-and-rotate-landscape routine that unlocks the phone and starts the camera isn't something you'd use daily but it's there to show that Samsung would not settle for second-best. As for the rest, these are two Ice-cream Sandwich packages that are very similar in terms of core functionality. Even some of the added features are the same, like the Apt-X audio codec for high-quality stereo sound over Bluetooth. The burst shot, HDR and the ability to simultaneously take photos and videos are available in both smartphones too. So is the wireless HDMI connectivity (Samsung AllShare Cast & HTC Media Link HD). Both the One X and the Galaxy S III offer free extension to your Dropbox storage, 25GB by HTC and 50GB by Samsung (both over 2 years). Normally, the software comparison would've boiled down to deciding between Sense and TouchWiz but Samsung are tipping the scales in their favor with an impressive set of extra features, some of which are exclusive to the Galaxy S III. Of course, not all of them are deciders. The S-Voice is a direct take on Siri, but it really fails to live up to expectations, while the NFC-based media sharing over S Beam has limited application for now. Pop-up play will rarely be used while Buddy photo share borders on useless. 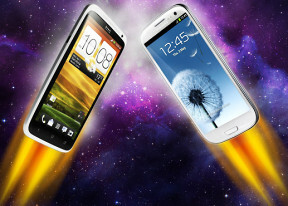 For more details on these added features you can check out our dedicated Galaxy S III preview. The ones we're most impressed with are Smart Stay and Direct call. Direct Call lets you dial a number by lifting the phone up to your ear while browsing contacts or reading/composing a message. Smart stay uses the front camera (most likely) to detect whether you're looking at the screen before switching to standby. You no longer have to worry about the screen dimming or shutting off when you're right in the middle of something. There are some new gesture controls too, while all the HTC One X has to offer in terms of added features is Beats Audio. Of course, when it comes to the core ICS functionality, the two phones have everything a flagship needs to have. The Galaxy S III is way ahead in terms of extra add-ons but these features may not be equally relevant to all users. What everybody cares about is performance, so let's move on to our benchmarks.